Posted on July 10, 2013 by Nida S.
Pakistan is notorious for a lot of things. Electricity shortage continues to stand out from the gruesome front runners – security threats and economic disparity; The perfect ingredients to derail any sane mind BUT a Pakistanis’. All hell may literally break loose in Pakistan, but pick any common person from a crowd and there is always room for more in the snake pit; for more morsels in their hearty appetites for despair. Maybe because they have no other choice. Maybe because they are built that way. Human Play-Doh is what I’d like to call them. You can bend them, squeeze them, stretch them; they refuse to give up their original, resilient, stubborn forms. I always knew this fact. But the intensity of this realization came knocking on my door just a couple of days ago. Good old Toronto was visited by torrential rains. The thunderstorm apparently had some old score to settle, because the amount of rain that fell during one hour that evening was equivalent to the estimated rainfall for the entire month of July! 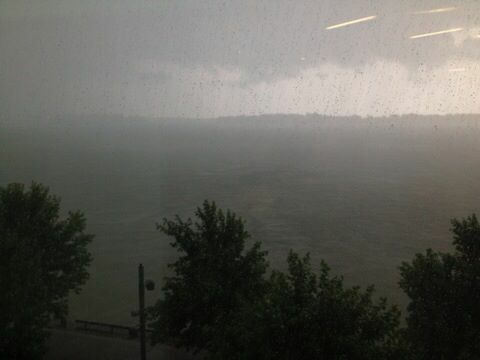 From my brother’s condo, the sight was breathtaking; mesmerizing grey clouds swaying right and left to the uproarious beats of the winds – rain pouring forth as if God had plucked the Niagara Falls and flipped them upside down. I was busy wasting time on the internet when I noticed the light bulbs flickering. This suddenly took me to Lahore and the endless days and nights of electricity outages. The silly comparison was brushed off as quickly as talks of India-Pakistan conciliation. Five minutes later, it did not seem as silly. Nature had taken her turn. This time the Canadians of Toronto were under the microscope. Black out. Cellphones popped out, fingers hurriedly dialed friends and family nearby to inquire about the electricity situation in their areas. Apparently many areas of Toronto, including Mississauga had been badly affected by the thunderstorm. I had family stuck in three different areas of the city. I will come to that little discrepancy later. Now the problem with developed countries such as the US and Canada is their over dependence on technology. Too much of a good thing is bad, or something like that? Electricity is essentially a Goddess. She controls all. Knows all. Pull a plug and she can revert the most technologically advanced nations to the basics. For example; without power, we had no water, no light, no internet, no traffic system, no cooking, no nothing! I was surprised but mostly amused. I kept thinking about how this would translate back in Lahore. Simply put, life would go on with a shrug of the shoulders and for some lucky folks; a switch to backup generators. Of course this supposed nonchalance or bravado in troubling times is not an over night achievement. This particular brand of Pakistani thick skin took years of practice and struggle. The theory of Behaviorism suggests that excessive repetition can lead to desired changes in the external surroundings. Desired or not, Pakistanis have come a long way. Nothing really surprises them or falters them any more. Many would call this indifference. To me its largely a case of ‘been there done that’! Coming back to thundery Toronto that day, panic was evident. I am sure people who experienced the massive 2003 blackouts must have shriveled at the thought of it happening again. Traffic system was in a frenzy, leading to several accidents. All stores closed down; Flights cancelled; People stranded for hours. 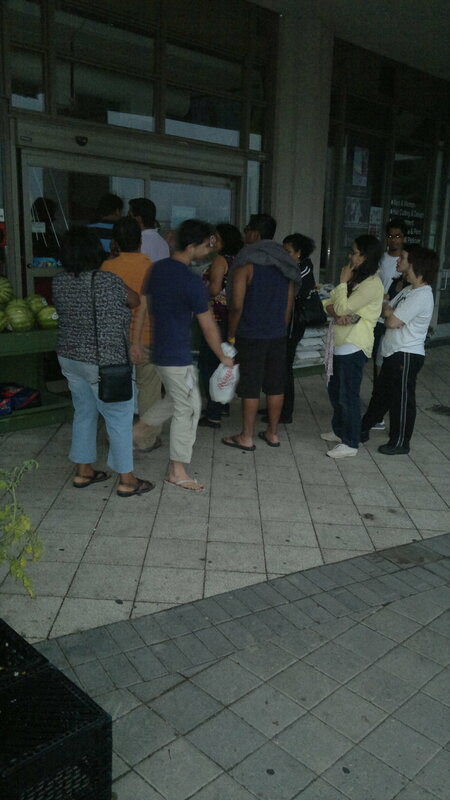 Some convenience stores were open in candle light with long queues of people looking for bottled water. One standout of the evening was the Go Train incident that was flooded with water; with people jumping out wearing life jackets. This two-in-one transportation mode would have amused some in normal circumstances. Poor creatures had too much on their plates owing to the rarity of the situation. In Pakistan a similar incident would not have invoked such media frenzy; and would probably have ended with most of the passengers becoming self-taught swimmers. Having said that, the overall disaster was no way near what could have occurred in the absence of an efficient damage control system. Kudos to the Canadians! Emergency elevators were thankfully operating in some of the buildings including ours, so we were saved from the fearful prospect of climbing down twenty-one floors. I returned to my place relieved that I had candles at home. One little detail however was missed. No matches. So that was pretty much the highlight of the power outage at my end. My family managed to return home safe and sound. I sat back, prepared for an all-nighter in the dark; undeterred, apart from fleeting thoughts of a horrendous bathroom show – starring two small children and no water. The drama did not last long in our part of the city and power was thankfully restored. Without exaggeration, I could hear shrieks of joy echoing from the surrounding apartment buildings! Something you’d hear in the stadium ensuing a touchdown or goal probably. I hear there are reports of further downpours this week. ‘Bring it on!’ I say. Oh but first, I’d better stock up on matches and lots of water.